This Rising 5 review was made after playing the game five times. 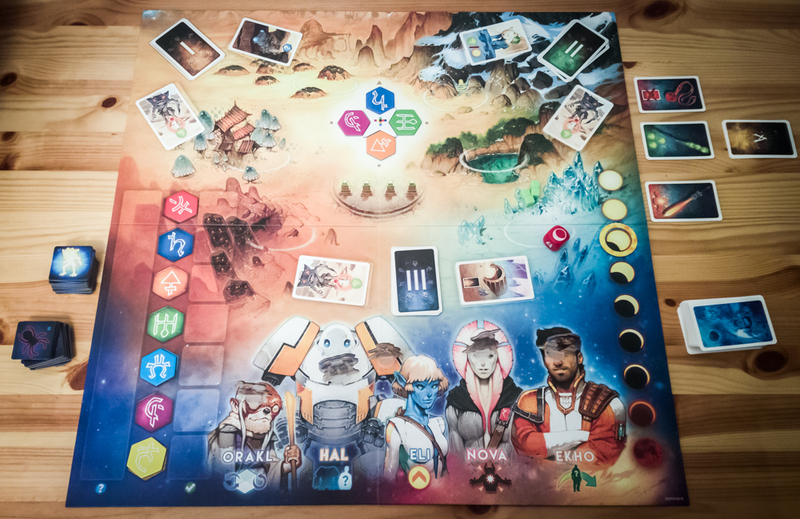 Rising 5: Runes of Asteros is a cooperative deduction game in which five heroes are attempting to close a Rune Gate before evil monsters are able to take over their planet. It’s kind of like a co-op version of Mastermind that is playable for up to five players and uses an app so no one needs to be the game master (though you do have that option). Rising 5 was created by Gary Kim and Evan Song, and it is published by Grey Fox Games. To begin a game of Rising 5: Runes of Asteros, you will shuffle the seven Rune tokens and place four of them around the Gate marker on the board. You’ll then scan the runes with the app and it will create that game’s puzzle for you. Your job is to put the correct runes in the slots before the Red Moon (health) track reaches the Total Eclipse space. You’ll only be activating one of the five characters per turn, and each action requires one of that character’s cards. For example, if you want to move to a location and then encounter a card at that location, you’ll need to play two of that character’s cards before you start taking actions. Each character also has a special ability that you can activate before taking your turn. Orakl, who is easily the most important / powerful character, allows you to move Runes around. Eli is able to move the Eclipse marker one space up the Red Moon track. Nova can fight any monster from any location. Ekho can move other characters around the planet. HAL doesn’t have his own special ability, but he can copy the ability of any character in his location. There are three types of actions in this game: Move, Encounter, and Seal the Gate. You can do any of these actions on your turn (even repeating them) as long as you have enough cards on the table. When doing the Encounter action, you’ll either be fighting a monster or simply gaining rewards from Helper and Artifact cards. When you fight a monster, you’ll roll a die and try to meet or exceed the number on the monster’s card. You get +1 to your dice rolls for having other characters on your space and you also get +1 for each character card other players give you. If you win the battle, you’ll gain the rewards shown on the card. If you lose, the Eclipse marker moves down the Red Moon track by the number of Red Moons shown on the monster’s card. Successful encounters can give you a number of rewards, including Silk cubes, healing, and clues. Some rewards are immediate, while others come in the form of relics and artifacts. When you gain relics and artifacts, you place them next to the board and anyone can use them on future turns. When you get a clue, you’ll be able to find out the identity of one of the runes in the app. If your team has been able to gather four Silk cubes, you can take the Seal the Gate action. This is when you get to see how close you are to closing the gate. You’ll scan the four runes and the app will show you symbols that are dark, shining, or golden. A dark symbol means that a rune isn’t part of the puzzle, the shining symbol means a rune is in the wrong position, and the golden symbol means a rune is where it’s supposed to be. What you’re trying to do is figure out the symbols that go with each of the runes; you can keep track of this both in the app and by placing the symbol tokens next to the rune colors on the board. The app also shows you a history of your scans so you can quickly compare results. At the end of your turn you can draw as many cards as you want to up to your hand limit. The reason why you might choose not to draw more than one card is because there are Red Moon cards in the deck. When drawn, the Red Moon is placed face-up on top of the deck and activates at the end of the next player’s turn. When the Red Moon activates, you count up the total amount of red moons showing on the monster cards in play and move the Eclipse marker down that many spaces. If you’re able to put the correct runes at the gate and perform the Seal the Gate action, everyone wins! You’ll lose the game if the Eclipse marker ever reaches the last space on the Red Moon track or if the character deck ever runs out of cards. So, to sum up, you’re trying to take down some monsters, gain some Silk Cubes, put the right runes in the right locations, and seal the gate! Rising 5 is definitely a gateway game, but there are some tough decisions that need to be made. It’s an easy game to learn, but I think gamers of all experience levels will have fun figuring out these puzzles. All of the characters feel different and useful. I worried at first that HAL and Eli would feel weaker than the others, but those two can be keys to victories. The art on the board and cards is very nice. The Beginner difficulty level is easy to beat, but the Standard and Heroic levels offer a good challenge. The app is great. You don’t have to spend too much time looking at it and it’s pretty awesome that you can look through all of your Seal the Gate attempts to help you solve the puzzles. 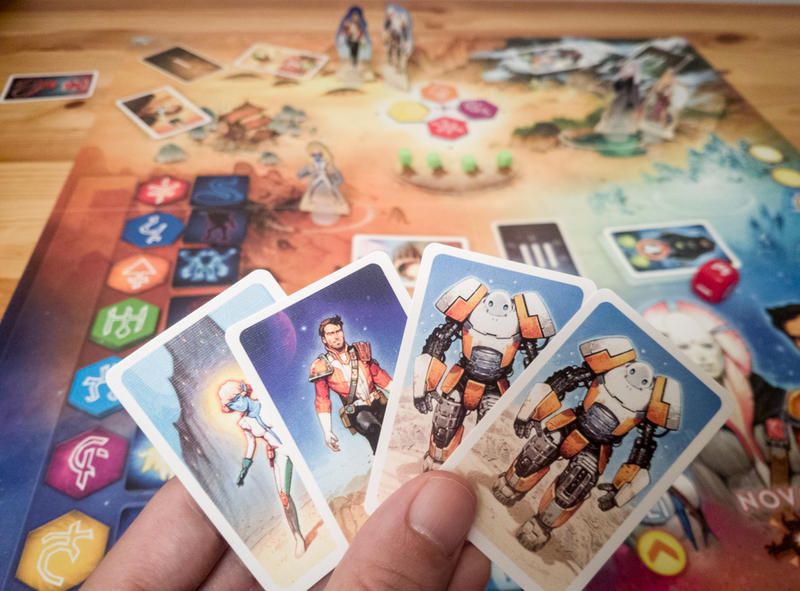 I wouldn’t say the game is equally good at all player counts – it’s best with two or three – but it is a solid game even at four and five players. Once everyone knows the rules, you can pretty much guarantee that your games won’t take more than 40 minutes regardless of player count. It doesn’t overstay its welcome and it works quite well as a starter game or as a wind-down game. 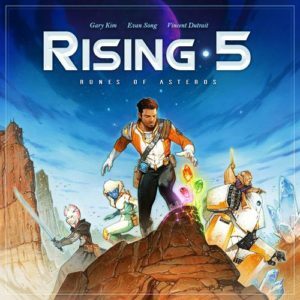 Rising 5 might lack long-term replayability. It felt great scanning the runes and trying to solve the puzzles during the first couple of games, but it wasn’t quite as satisfying after that. It’s still fun after five games, but I could see this one dropping out of the rotation pretty quickly for some people. There’s definitely cooperation in Rising 5, but I was hoping for a little bit more. Even adding in the ability to swap cards or giving one of the characters a cooperative action would have been enough for me. There are only 27 Region cards in the game. Once you’ve seen all of them, which only takes a couple of games, you’ll know what to expect every game. I wish they had included 10 or more extra cards so the regions would always have a slightly different mix. You’re not going to have the dreaded quarterbacking / alpha player issues in Rising 5, but some players will feel less involved if they’re not good at deduction. If you’re playing with one person who is really good at logic puzzles, chances are they are going to figure out the rune configuration before everyone else. Those who aren’t too good at these types of puzzles might feel a bit left out. Rising 5: Runes of Asteros is a unique co-op and one my group has enjoyed playing over the last couple of weeks. It’s easy to learn, it’s quick, and it looks great on the table. It’s kind of like Pandemic with some deduction mixed in, which is a combo a lot of people will like. I can’t say this was a hit for me, but it is one of those games that I’d give as a gift and be confident the receiver would enjoy it. Thanks for taking the time to read our Rising 5 review! To stay updated on all things cooperative board games, follow us on Twitter, Facebook, or via RSS. Hmm, on the fence with this one. I can’t decide if I should buy it. I bought Professor Evil and The Citadel of Time and played that about 10 times but it hasn’t made its way back to the table. I’m thinking it’s because we lost so many times and we became discouraged. I’m worried that would happen with this one too. I wouldn’t worry about that with Rising 5. Your win rate at beginner level should be about 75 percent, and it’ll be about 50-60 percent at standard difficulty.